I recenty made myself a whiteboard for writing notes and reminders while at my desk, however I was becoming frustrated with never being able to find my whiteboard pens as no matter where I put them they would always seem to bury themselves under a pile of paper whenever I needed to use them. So I decided to make a holder for them so they would always be accessible when I needed to use them and to help de-clutter my desk. After a bit of thinking I noticed that the body of the pens was slightly tapered, they were 15mm at the base and 17mm towards the tip, so I came up with this solution using a series of 16mm holes to hold the pens in place inspired by the test tube racks we used to use when I was at school. The whole project was done in a day and that included about 3 hours waiting for the various coats of paint to dry. It is made of an offcut of 1mm thick plastic from an old picture frame that I had to cut down to the correct size, but you could just as easily use a CD hewel case or similar. It also incorperates an even smaller offcut of 3mm thick perspex for the 2 sides and 2 supporting brackets, although you could probably use 2 bits of the 1mm thick plastic glued together instead. Because the plastic was only 1mm thick it is very easy to work with, to cut it to size simply requires scoring both the top and bottom using the knife, then resting the seam on the edge of the table and placing the steel ruler on the top, you can then simply snap the plastic along the seam and get a perfectly straight break. The 3mm plastic is worked in the same way, although you have to score it more deeply and apply more force to it to break it. For your own safety you should wear protective goggles and gloves when doing this stage. 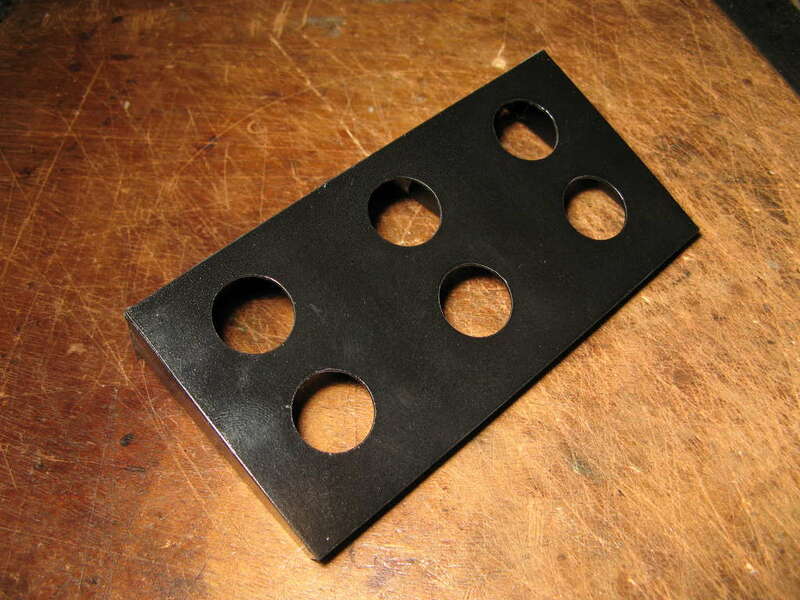 The holes in the top are drilled using a 16mm drill bit and are spaced as shown in the photo. Once the pieces has been cut and drilled it was time to assemble them. I used the handle of the square to rest the top of the holder against I then tacked the back to it using a glue gun to ensure I got a perfect right angle. Once the glue had set enought ot hold the back in place I attached both of the side pieces, ensuring they were glued along the seam with the top and the seam with the back. The holder was fairly rigid by this point so attaching the 2 remaining supports was fairly easy, each of the supports needed to be glued alon 4 edges. Then the remaining seam between the top and the back could be glued. Once the holder was assembled I then spray painted it, first with a coat of grey primer, then once that had dried a few coats of black paint and finally once that had dried a protective coat of clear varnish. As the paint is unlikely to be scratched or chipped from underneath I only applied the varnish to the top and sides. I used "Hycote" acrylic based paint which is intended for spraying car bodywork, but works just as well on plastic. All that is left then is to mount it on the wall. I drilled the first hole and then mounted the holder on it, then used a spirit level to make sure it was level before marking and drilling the second hole. As you can see the pens rest at differing heights, I first thought this was due to inaccuracies in the sizes of the holes I had drilled, but then realised that there are slight variations in the thicknesses of the pens.